BICC Publications/Defence conversion: Dead duck or still a relevant object of study? You are here: Home » Publications » Defence conversion: Dead duck or still a relevant object of study? 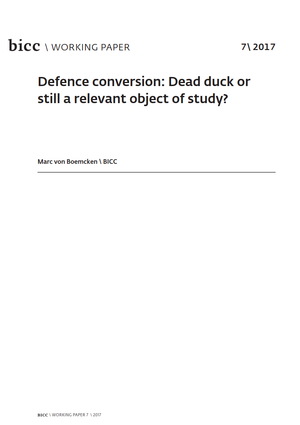 Defence conversion: Dead duck or still a relevant object of study? The propositions put forward to this end lean toward a comparatively conservative approach that pays close attention to the historical legacy of conversion as a concept. In sum, Conversion Studies should be a multi-disciplinary, critical and policy-relevant field of research that advocates social change based on analyses of political economies of violence, particularly in the affluent, industrialized and comparatively peaceful- societies of the Global North. At the same time, it ought to abandon its past reliance on a simple civil–military dichotomy and, instead, engage with the more complex issues raised by a focus on 'organized violence'.